PanARMENIAN.Net - Ukraine’s nuclear regulatory body reported smoke at one of the rooms at Unit 3 in Chernobyl, adding that it was briefly “liquidated” by the state emergency personnel and the radiological situation at the site has not changed following the incident, RT reports. “At 15:57 pm we’ve received information from Chernobyl nuclear power plant about smoke in room 509 of Power Unit Three. At 16:00 the smoke was liquidated by the State Emergency Service staff,” a statement issued by the State Nuclear Regulatory Inspectorate of Ukraine reads. 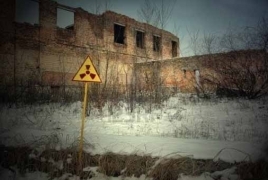 “The radiological situation in the third power unit and the station’s territory has not changed,” it added. The Soviet-era Chernobyl nuclear power plant is known around the world for the accident, one of the worst ever, that took place there on April 26, 1986, when a failed safety experiment caused a catastrophic meltdown at the plant’s Reactor 4. An explosion followed, destroying the reactor and releasing large amounts of radiation into the atmosphere. Following the accident, a 30-square kilometer zone surrounding the NPP was evacuated and declared uninhabitable, while the large radioactive cloud spread across more than 200,000 square kilometers. The nuclear fallout contaminated large areas in Ukraine, Russia and Belarus, then republics of the Soviet Union. Over 30 people died immediately or short-term after the accident. The total number of radiation-related deaths caused by the disaster could have amounted to about 4,000 by 2005, according to a massive study conducted by an international team of more than 100 scientists. Following the disaster, a steel and concrete sarcophagus was constructed over the destroyed Reactor 4 to encase the dangerous area and prevent the remaining radioactive materials from getting into the atmosphere. The sarcophagus deteriorated over time, due to extreme levels of radiation, and was deemed unrepairable by 1996. The construction of a new, internationally funded, shelter began in 2012. The giant steel radiation shield was maneuvered into place over the existing steel and concrete structures in November 2016, but construction is still under way. The replacement shield, costing €1.5 billion ($1.6 billion) and built by French consortium Novarka, is designed to withstand a tornado and has an expected lifespan of at least 100 years. Power Unit 3 was launched in 1981 and remained operational even after the 1986 disaster. The unit was the last part of the nuclear plant to be permanently shut down in December 2000.